For Microsoft, 1995 was filled with Windows. 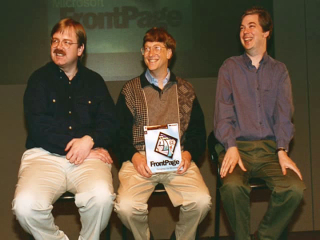 On January 7, 1995, during his first keynote at the consumer electronics show in Vegas, Bill Gates announces Microsoft "Bob" for Windows. Microsoft and Dreamworks SKG announce that they have signed a joint-venture agreement to form a new software company and we announce internet explorer 1.0 for Windows 95. The 1995 fiscal year-end sales total $5,940,000,000. The 1995 fiscal Year employee headcount totals 17,801 people. · The Internet and World Wide Web explode in popularity and content, sparking heated debate of issues such as accessibility, censorship, privacy, and regulation. · IBM pays $3.5 billion for Lotus Development Corporation. · After tabulating 100 million votes, Mars, Inc., announces that blue is the overwhelming color of choice for the new M&M, winning over purple and pink. · Oklahoma City: The Oklahoma City federal building is destroyed by a bomb blast, killing 168. Far-right militia member Timothy McVeigh is quickly arrested and convicted of the crime. · Reeve: Actor Christopher Reeve is paralyzed from the neck down in a horse-riding accident. · Internet: Amazon.com makes its online debut. · Earthquake: A 7.2 magnitude earthquake hits Kobe, Japan, killing over 5,000 and causing $200 billion worth of damage. · OJ: O.J. Simpson is acquitted of murdering his ex-wife and her friend after a controversial 10-month trial. · Comics: The last new Calvin and Hobbes comic strip is published. · TV: “E.R.,” “Seinfeld,” and “Friends” are among the top television programs. “The Drew Carey Show” and “JAG” premiere. · Balkans: The Dayton Accords end the three-year war in the former Yugoslavia and establish the independent nation of Bosnia-Herzegovina. · Israel: Prime minister Yitzhak Rabin is assassinated by a right-wing Israeli extremist. · Ebola: An outbreak of Ebola virus kills 244 in Zaire. · Computing: Sun unveils the Java programming language. · New Networks: The UPN and WB networks go on the air. · Trade: The World Trade Organization (WTO) is established, superseding GATT. · Terrorism: Japanese cult Aum Shinrikyo releases Sarin nerve gas in the Tokyo subway, killing 12 and sickening over 5,000. · March: Nation of Islam leader Louis Farrakahn promotes a Million Man March of African-Americans in Washington, D.C.
· Movies: Top grossing movies of the year include Apollo 13, Babe, Toy Story, and Twelve Monkeys. Braveheart nets Oscars for Best Picture and Best Director (Mel Gibson), while Susan Sarandon wins Best Actress for Dead Man Walking, and Nicolas Cage takes Best Actor for Leaving Las Vegas. 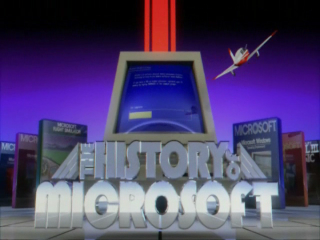 This "Microsoft BOB" sounds excellent! I hope it's ready soon... And with over 14 years of development time it must be even better by now than it appears in the video! Why does the 1995 year page not list products shipped? Please include list of released products. Amazing video btw.